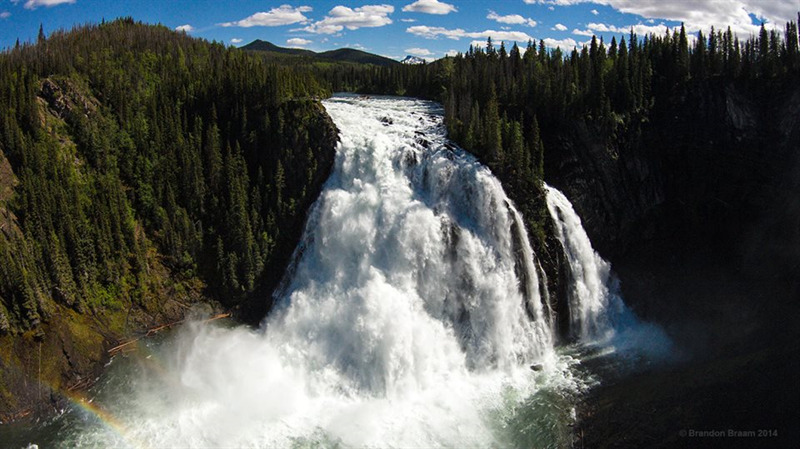 One of the true gems of the Tumbler Ridge area is Kinuseo Falls. Featured in the 2015 fantasy hit The Seventh Son, Kinuseo Falls is a spectacular 70m cascade. Taller than Niagara Falls it showers over 40m3 of water a second at its peak season into the valley below! Kinuseo Falls is attached to a Monkman Provincial Park. Drinking water, day use picnic areas, and pit toilets. Vehicle accessible camping, tent camping, and walk-in/wilderness camping. View the falls from all angles and start your Monkman Provincial Park hike from here. Walk down the Murray and try your luck. Flatbed hosts a number of picnic tables with BBQ pits for day use. Use the many interpretive signs to learn about the diverse wildlife in the area. Keep your eye out on your drive in for Buddy the locally famous beaver who has made his impressive home in a lagoon near the entrance to the park. Take a majestic jetboat tour up the Murray River to come up to the base of falls.